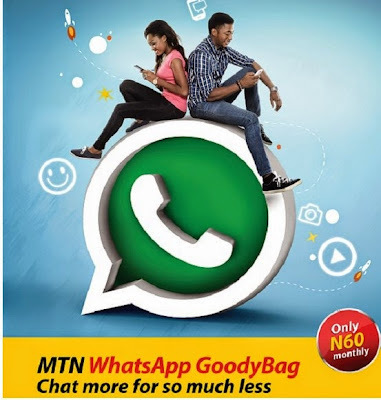 The MTN Whatsapp Goodybag is the data bundle for Whatsapp users on the MTN network in Nigeria, this data plan offers unlimited connection to whatsapp at a low and affordable cost. Subscribers can either subscribe for the weekly plan or monthly plan which costs #25 and 60 Naira respectively..
To subscribe for the MTN Whatsapp weekly plan, you should text WAW to 131 and ensure you have up to 25 naira credit on your MTN line before sending the message. To subscribe for the MTN Whatsapp monthly plan, simply send WAM to 131 and make sure you have not less than 60 Naira credit on your MTN line before sending that message. If you wish to unsubscribe at any point in time, simply send NO followed by the relevant keyword to 131. For example, send NO WAM to 131 to unsubscribe from the Whatsapp monthly plan. Mine is working. maybe you have to switch your DATA sim from what it use to be to MTN..if you are using a DUAL sim phone. I just did it and its working fine.